Well, sometimes one’s wildest imaginings do come true—and more so! 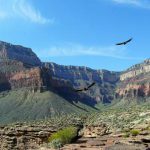 Who would have guessed that today during the warmer months we would be giving condor talks in Grand Canyon Village while condors circle above or perch on rocky outcrops within a few hundred feet below us? Once or twice I have actually had a condor fly so close I ducked. Another time I’ve had the privilege of watching a condor fledgling being fed by his mama on an outcrop right below Bright Angel Lodge. In hindsight, it seems obvious that the condors would be attracted to Grand Canyon Village. The watered lawns, various natural and artificial water sources, and major trails into the canyon all serve to attract an abundance of deer, elk, and bighorn sheep, which upon their deaths provide food for condors. Rocky outcrops and Douglas-fir trees below the north-facing cliffs provide pleasant and safe overnight roosts for condors in warm weather. Add a leaky pipeline for a shower or drink and some baseball caps and empty water bottles to play with, and you have pretty much everything these intelligent and inquisitive birds can desire. California condors are one of the most dramatic and one of the most dramatically endangered birds you will ever have the privilege of seeing in the wild anywhere. And it is somewhat of a miracle that we get to see them doing their thing here in the wild. In 1982, only 22 California condors existed in the world. We will never know all the details of how their numbers became so low. Clearly people have a history of shooting condors. Since the first release at Vermilion Cliffs in December 1996, three condors have been fatally shot in Arizona, one of them by a fisherman in Grand Canyon National Park! People have also impacted their habitat and probably their food sources, stolen their eggs, and inadvertently killed condors when setting out poison for coyotes and other predators. But the greatest threat to condors today certainly also played a significant role in their decline prior to 1982–lead poisoning. As strict carrion feeders, condors seek out large mammal carcasses or portions thereof. Too often, those carcasses or gut piles contain lead rifle bullet fragments. Biologists for The Peregrine Fund, the lead agency dealing with the re-introduction of condors in Arizona, spend much of their time testing and treating condors for lead poisoning. Nevertheless, lead poisoning remains the most common cause of death for the wild condors in this area. Fortunately, the Arizona Game and Fish Department has an active program to encourage hunters in northern Arizona to switch to non-lead ammunition. During the 2007 hunting season, more than 80 percent of northern Arizona hunters voluntarily made the switch. And in California, a new law now bans lead ammunition for hunting large game in areas inhabited by condors. Perhaps more influential in getting hunters to switch are the recent news articles discussing the presence of lead in people who have eaten wild game killed with lead ammunition. In fact the North Dakota health department now recommends that young children and pregnant women should avoid eating wild game killed with lead bullets. So there is hope that the lead ammunition problem can be resolved. Meanwhile, the captive breeding program has been tremendously successful and condors are breeding in the wild again as well. The world total is now over 300 birds, with over 60 in the northern Arizona/southern Utah area. As of this writing, there are eight free-flying condors that hatched in the wilds of northern Arizona. This includes two fledglings still being cared for by their parents after recently leaving their nest caves deep in the Grand Canyon. For the best opportunity to see a condor, come during the warmer months, April to September. You might also be lucky enough to see one in late March or October, or perhaps on a hike down to Plateau Point in February or March. May through July seems to be the very best time. During the warmer months, keep an eye out for condors soaring over the canyon or either rim by day. Also check out the cliffs and Douglas-fir trees below Grand Canyon Village on the South Rim late in the afternoon. That’s when condors tend to pick out their overnight roosts, and most nights in the summer they either roost there or at least give it some consideration. If you see a condor, enjoy it! This is the largest soaring bird in North America, with a wingspan of up to 9 ½ feet. An adult (age six and up) has a pink head, neck and crop, and a long triangle of bright white under the leading edge of each black wing. Juveniles (under age four) show splotchy white or gray under the leading edge of the wing, and a black head, neck and crop. Turkey vultures, a smaller member of the same family, are also common at Grand Canyon. They are more brown than black, and the leading edge of the wing seen from below is darker than the trailing edge. In flight, condors are like a soaring plank with their long wings held out straight and a very steady flight. Turkey vultures weigh about a fifth as much, so they tend to tip a lot in flight, and they usually hold their wings up in a shallow V when soaring. Of course if you see a numbered tag on a bird in Grand Canyon National Park, you know you’re looking at a California condor. Stop in at the Visitor Center, Park Headquarters or Kolb Studio to look up more information about any bird whose number you managed to read. Please stay at least 150 feet away from any condor. If you see one perched closer than that to people in a place where someone could easily get to it, please report it so a ranger or biologist can haze it away to a safer perch. Never feed any animal in a national park, and avoid dropping trash or tossing coins which might be ingested by wildlife. Following the ups and downs of the Condor Recovery Program and the social lives and nesting successes and failures of the breeding-age condors can be pretty captivating. For up-to-date information on the Arizona/Utah population of condors, check out “Conservation Projects” and “Notes from the Field” at The Peregrine Fund’s web site. 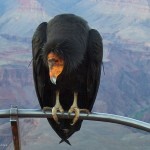 Also look for the Condor Updates on Grand Canyon National Park’s web site. Enjoy your reading, and good luck spotting some of these majestic, endangered birds next time you visit the park. After all, sometimes one’s wildest imaginings do come true! You can also find them on Facebook at www.facebook.com/condorcliffs.